Upstate New York is famous for its scenic atmosphere, so why not get outside and enjoy it? There are several walking trails in the area surrounding Glens Falls. Whether you're going on a relaxed nature stroll, walking for exercise or even taking your dog for a walk- there is a walking trail that's right for you. This trail meets up with the Warren County Bikeway. This is not a paved trail but it is finished with gravel. The Feeder Canal Trail begins at the Feeder Dam in Glens Falls and follows the Hudson River to the Champlain Canal and then south toward Fort Edward. This trail is approximately nine miles long and follows part of New York's few reminaing sections of the original 1820s canal system. Gurney Lane is only open during the summer months. This park offers three well-maintained color coded trails for walking. The trail loops vary in length from a half mile, three quarters of a mile and a full mile. There are also educational signs throughout the trails that offer information on the 28 different species of plant life in the park. Hovey Pond Park has a walking path that will bring you around the four acre pond. Three and a half laps around the pond equals one mile! There is also a wooden walkway to check out the marshland. Leashed dogs are welcome at the park if you would like to take a canine companion with you. There are three different marked walking trails at the Hudson Pointe Nature Preserve. Two of them are .75 miles and one is 1.1 miles. All three take you through the 83-acre preserve with scenic views of the Hudson River. The Meadowbrook Preserve has a marked 1.75-mile walking trail. It begins in the meadow, loops through the woods and back into the meadow. This trail also has 12 nature education signs that will share habitat information along the walk. This is another park that's dog-friendly! The Rush Pond Trail is a 2.2-mile long pathway right through the heart of Rush Pond wetlands. Walkers on the trail will come across three handmade bridges and be able to take in beautiful views of the wetlands. This nine-mile trail starts in Glens Falls and reaches all the way up to Lake George Village. The Warren County Bikeway provides smooth pavement thats ideal for walkers, joggers and bicyclists, alike. The trail is scenic and will take you over bridges, through woods, up and down hills and past streams and ponds. The Bog Meadow Nature Trail is located off Exit 14 on the Northway. It's a great trail to take a dog for a walk. The trail leads to a wetland habitat, so you may want to rethink walking this trail if it has rained recently as it could be muddy. This segment of the 71-mile Champlain Canalway is located in Schuylerville. This trail runs between Schuyler House, past Lock 5 of the canal and loops through Hudson Crossing Park. Located in the town of Granville in Washington County, this trail leads you to farmland in Western Vermont at the state's border. It follows an old Delaware & Hudson railroad line that operated between Rutland and Albany. This rail-trail exists in two equal length segments. To walk along the northern section, begin at the Castleon trailhead. 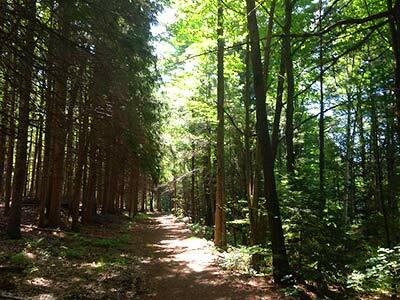 From there, the trail will take you through a lush forest and provide glimpses of Vermont farmland. Around 7 miles in, you'll reach Poultney which is near the Vermont border. The southern section of the trail begins in Granville and crosses into Vermont through a forest. Don't be surprised if you see a deer or two along the walk! This half mile trail is located right in the heart of Saratoga. It runs between West Circular Street and Congress Avenue. This trail is part of a growing network throughout both the town and the country. There are future plans to have the trail extend to West Avenue and to Saratoga Spa State Park, linking up with the Zim Smith Trail. Only one mile long, it's perfect for a quick walk. It's located off Exit 15 and begins in Congress Park in downtown Saratoga and runs through to Warren Street. The Zim Smith Trail is considered to be the "backbone" of a network of trails emerging in the area. It connects the towns of Halfmoon, Round Lake, Clifton Park, Malta and Ballston Spa, all a short distance south of Glens Falls. It's recommended to start the trail in Malta at Shenantaha Creek Park. This seven and a half mile trail will bring you slightly down hill through a very scenic route. We're lucky to have a few places in the Glens Falls Region where you can walk when the weather isn't cooperating. Aviation Mall in Queensbury is perfect for window shopping while you walk! Call ahead before you go to confirm that walking is allowed before the stores open for the day. Cool Insuring Arena, located right in Downtown Glens Falls, offers walking memberships for just $10 ($9 for seniors 65+). Members are welcome to walk or run in a loop around the top of the arena. Be sure to check the arena's walking schedule since special events, like sports tournaments and hockey games, can force adjustments to the regular hours.